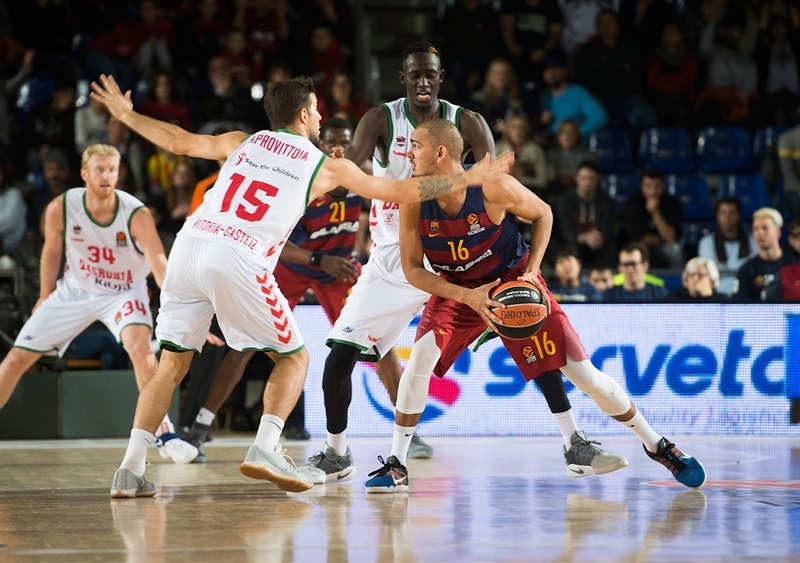 Baskonia Vitoria-Gasteiz bounced back from recent losses by downing FC Barcelona Lassa 79-93 at Palau Blaugrana on Friday. 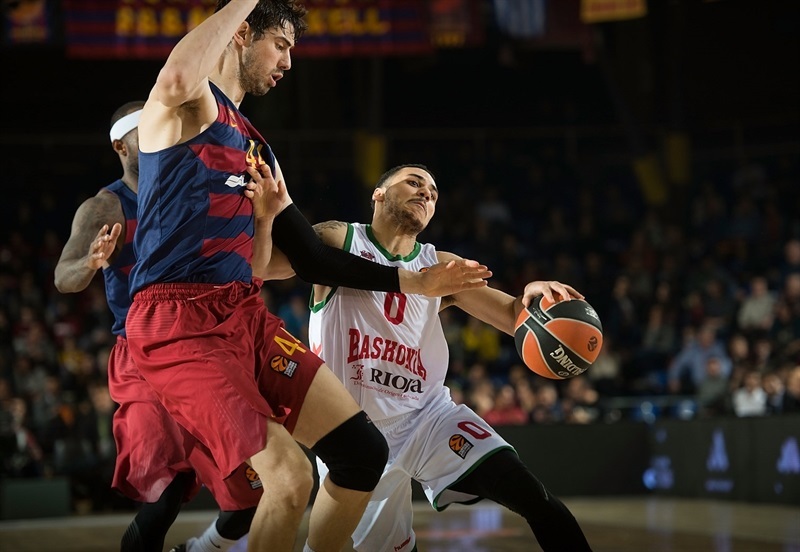 Baskonia improved to 12-8 in the Turkish Airlines EuroLeague standings and stopped its three-game losing streak with a prestigious road win, while Barcelona dropped to 8-12. 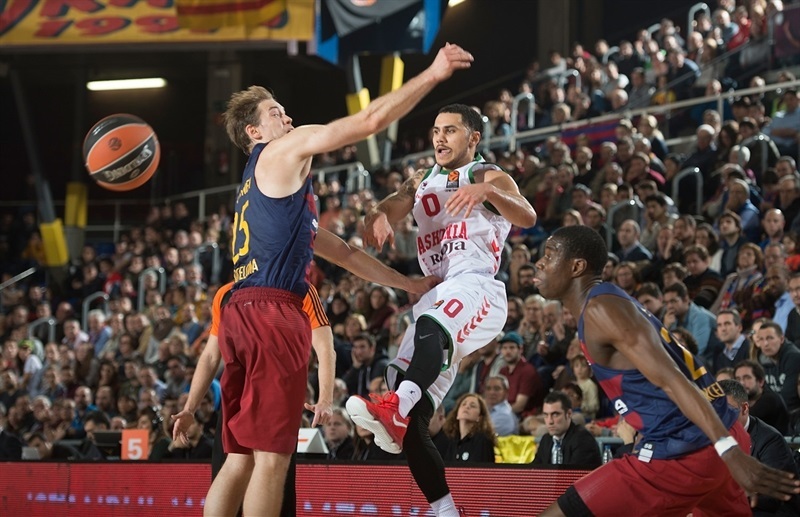 Shane Larkin led the winners with 18 points, Chase Budinger added 15, Adam Hanga 14 and Johannes Voigtmann and Kim Tillie each scored 13 for Baskonia. Tyrese Rice led Barcelona with 15 points, Sasha Vezenkov added 14, Vitor Faverani 11 and Justin Doellman had 10 for the hosts. Baskonia had a good first half, hitting 9 of 16 three-point shots (56.3%), dishing 11 assists and committing just 4 turnovers. 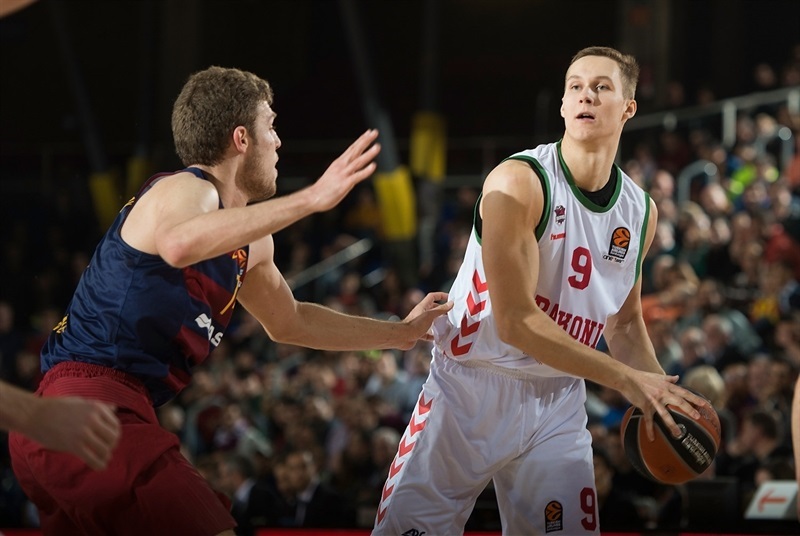 It also limited Barcelona to 4 of 16 two-point shooting (25%) and forced 9 turnovers, which helped Baskonia to a double-digit lead, 43-53, behind solid contributions from Larkin and Hanga. 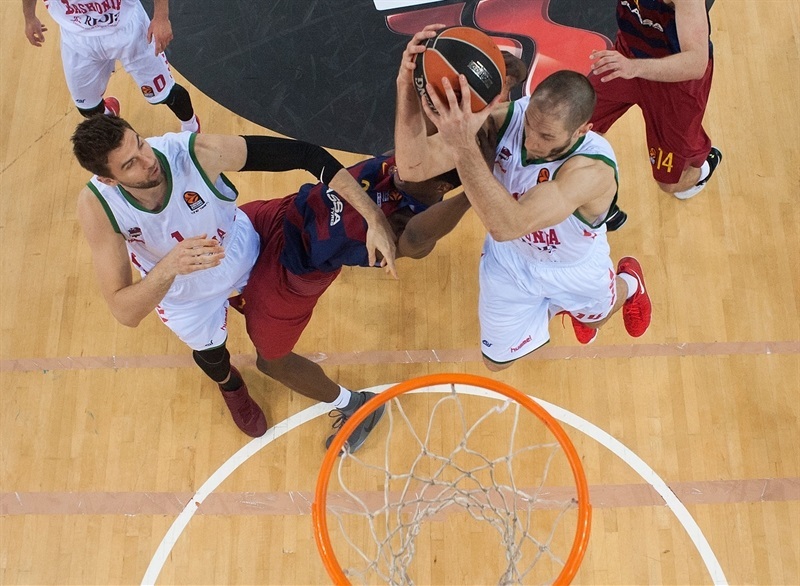 Nothing changed after that, as Baskonia boosted its margin to 55-80 late in the third quarter and never looked back. Doellman got Barcelona going with a three-pointer, but a fast break dunk by Tillie ignited a 0-11 run in which Hanga and Larkin each struck from downtown. 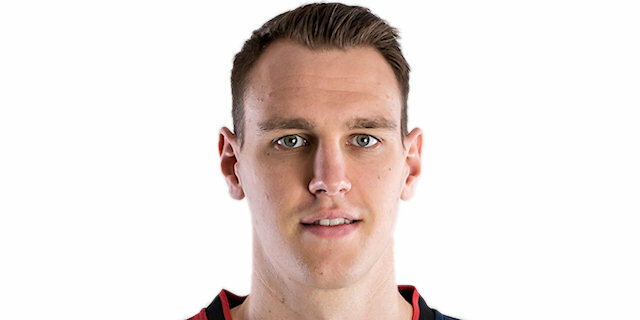 Doellman hit another triple and fed Rice for a fast break basket, but an unstoppable Larkin kept Baskonia way ahead, 9-16. 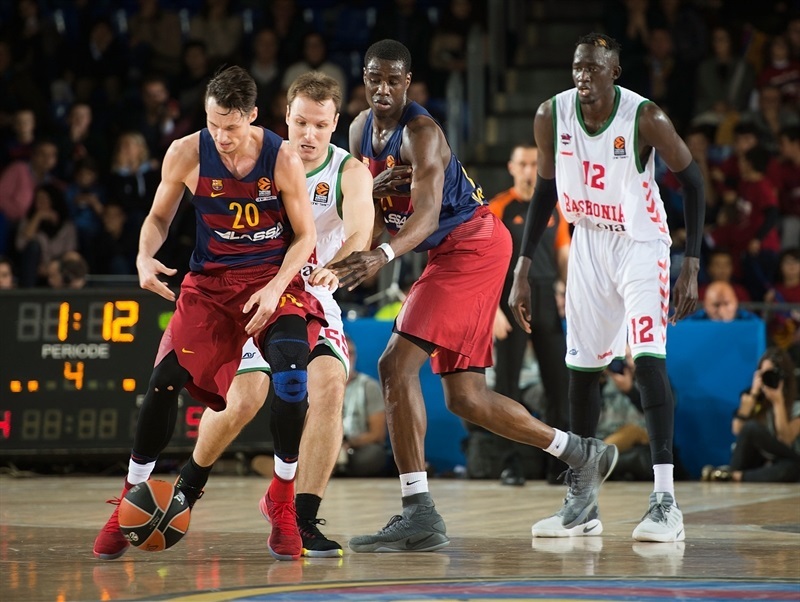 Doellman and Rice fueled a 9-2 run, which helped Barcelona tie it at 18-18. Voigtmann nailed one from beyond the arc and a dunk by Vitor Faverani fixed the score at 20-21 after 10 minutes. 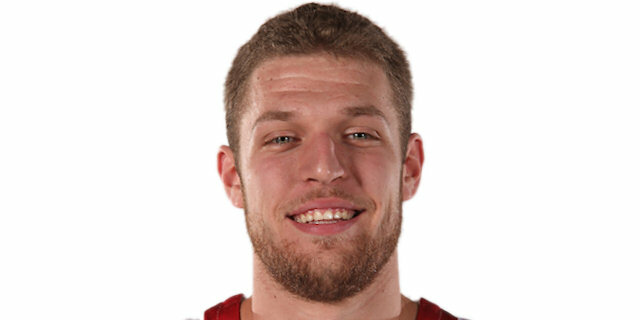 Petteri Koponen and Andrea Bargnani traded three-pointers early in the second quarter and a layup by Vezenkov gave Barcelona a 25-24 edge. 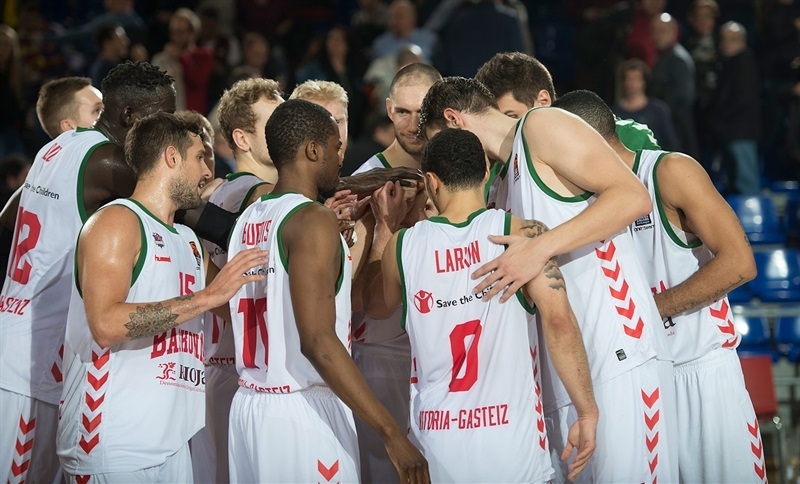 Faverani followed a layup with free throws, but Hanga took over with a three-point play and Tillie and Tadas Sedekerskis dunked for a 30-32 Baskonia edge. 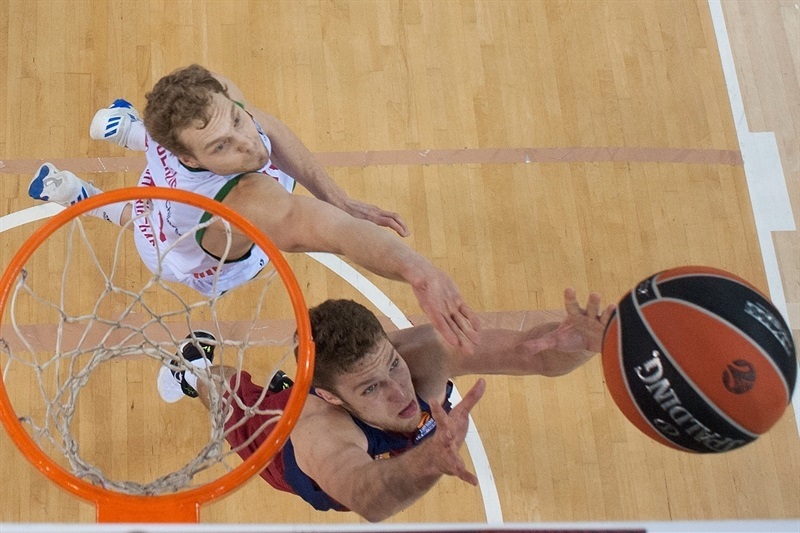 Larkin had 6 points in a 0-8 Baskonia run, but a red-hot Vezenkov scored his team's next 10 points to tie it at 40-40. 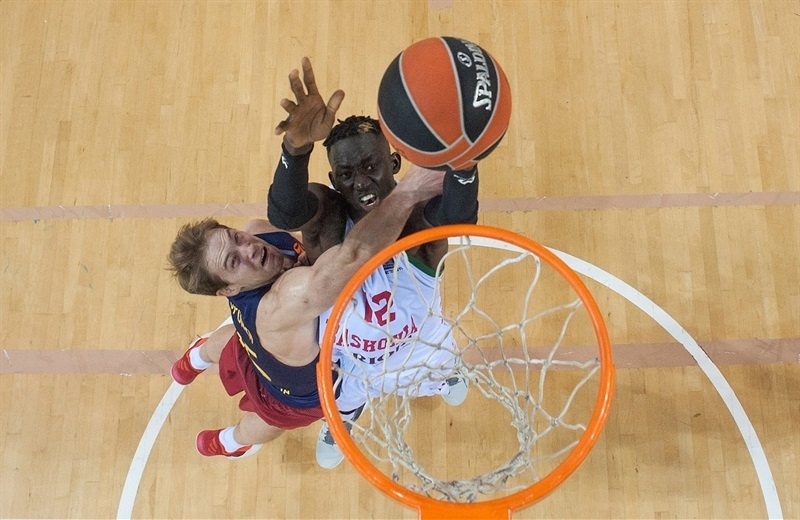 Voigtmann scored down low, Rodrigue Beaubois hit a triple and Hanga struck twice from downtown to give Baskonia a double-digit lead, 43-53, at halftime. 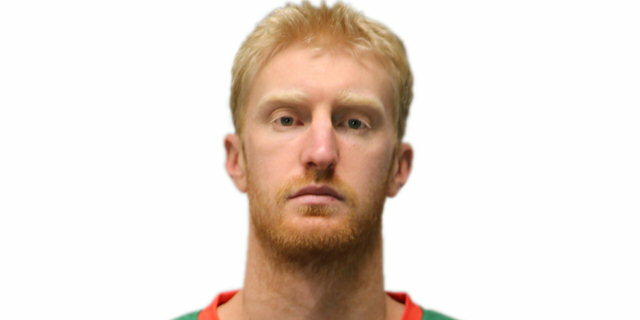 Budinger took over after the break to make it 43-60 with a 0-7 run. 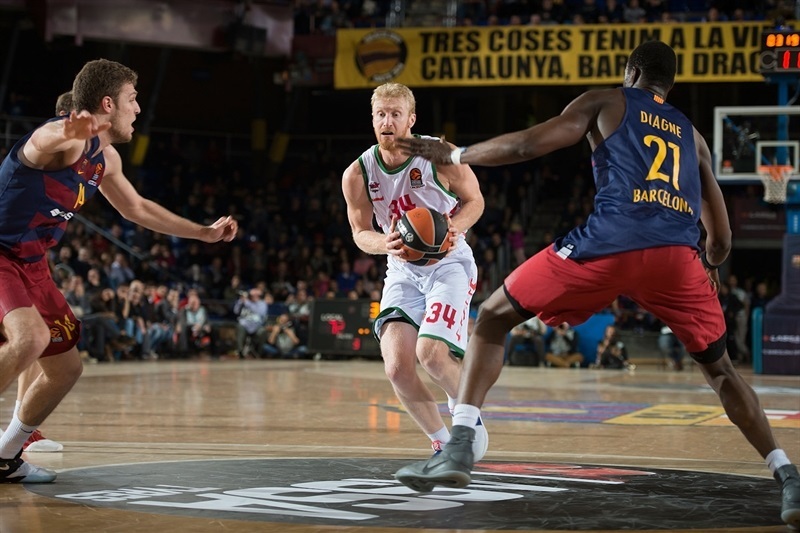 Rice and Faverani tried to ignite Barcelona's comeback, but Budinger and Tillie kept Baskonia comfortably ahead, 50-66. 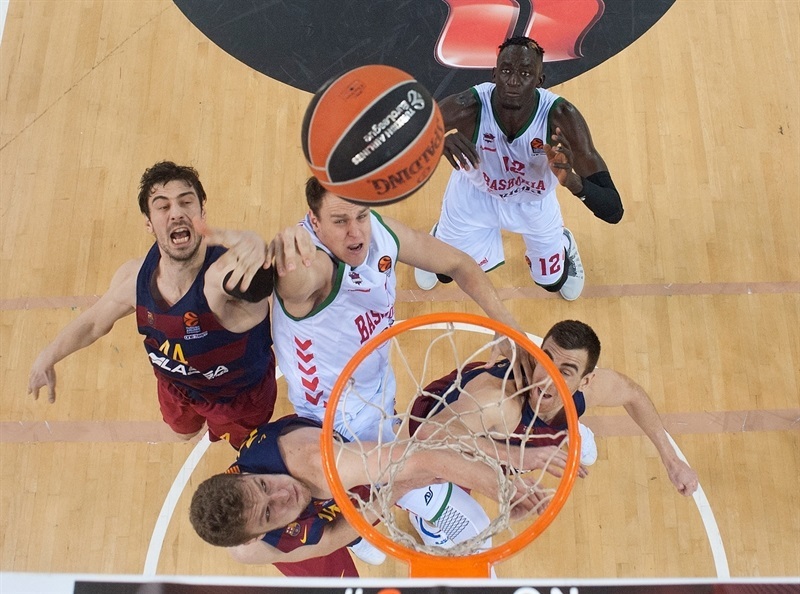 Budinger kept pushing Baskonia and back-to-back dunks by Voigtmann prompted Barcelona to stop the game at 53-74. 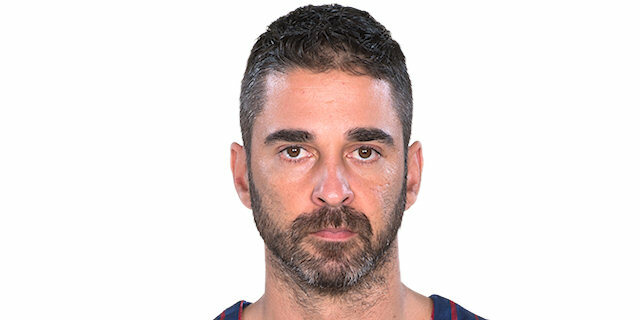 Baskonia kept finding easy points in the paint and a three-pointer by Nico Laprovittola kept his team fully in charge at 63-83 after 30 minutes. 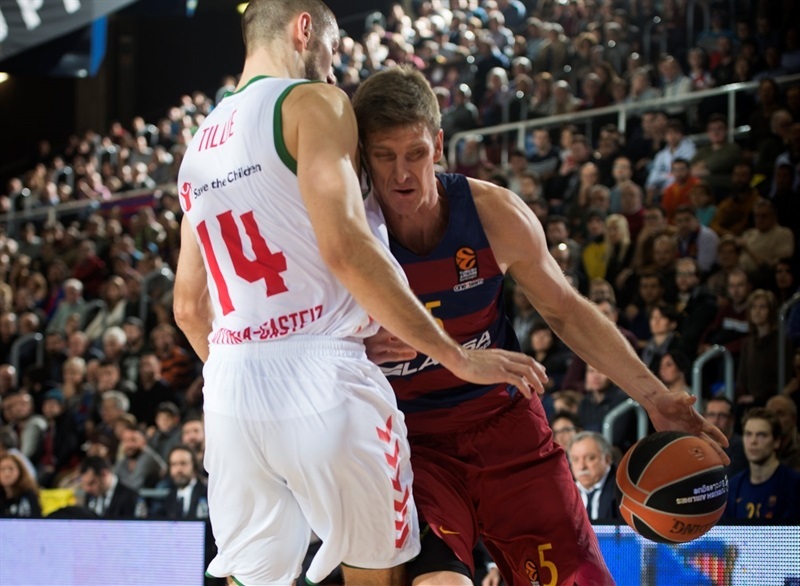 Barcelona tried a smaller lineup with Victor Claver and Vezenkov down low, but it only managed to exchange baskets. Baskonia kept a safe margin throughout the fourth quarter and cruised to a well-deserved win. "It was been a tough night for us. 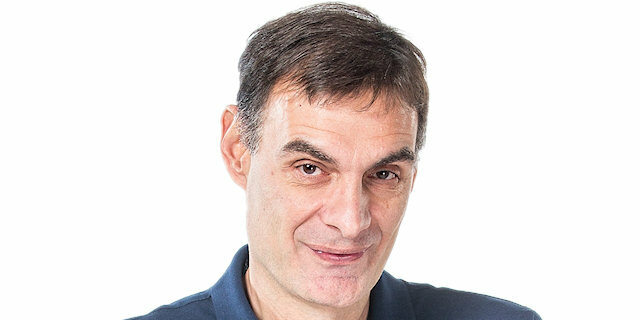 First of all, I would like to congratulate Baskonia for a perfect game. We need to play better, need more intensity on defense and offense to win this game. Unfortunately, we went not ready to play this game. Obviously, our chemistry is not good right now, without a second point guard and many backcourt players out, which influences our game. To find something positive, our young players keep fighting until the end for every possession. One more time congratulations to Baskonia. We are in the middle of a difficult season with everything that happened. We need to stay positive and fight every day, take good decisions, fight in every practice, in every game, to get in the right direction. I don't want to repeat myself about how many injuries we have. I would like to be realistic. It is a very big problem, losing so many players during the season, it makes us lose our confidence and sometimes our fighting spirit. Generally, the team is giving up; not every time, but in some moments of the game. Expectations are always huge in this club; it is a difficult, strange year with everything happening. First, we need to find a point guard to help us. Tyrese [Rice] is playing many minutes in the Spanish League and the EuroLeague for two months. We have to stay positive and analyze everything. We are fighters and have to see the next game and the next practice as the next challenge, being positive. I want to thank our fans, our audience at Palau Blaugrana, for being so supportive even in such a tough night like this." "We came out knowing that this was a very important game for us, because in the last two games we didn't show the playing level required to compete in such a demanding competition as the EuroLeague, especially on defense. We only wanted the team to play with much more intensity in every action, on offense and especially on defense. We did that in the opening five, six minutes, but made the small mistake of not putting that pressure because we were sending Barcelona to the foul line too often. We returned to play with intensity, putting pressure on defense all game long. Obviously, you only win if you play well and are strong on defense. 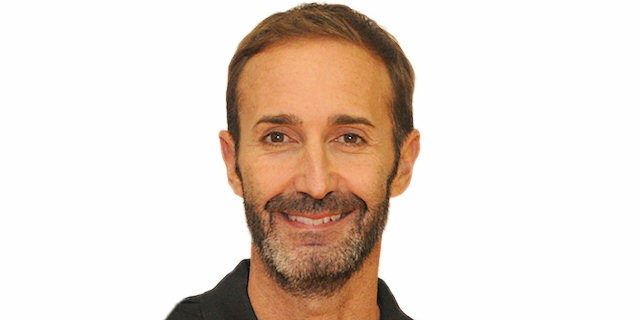 If we didn't play defense with high intensity and also had that intensity on offense, we wouldn't have been able to compete against Barcelona." "The truth is that we have hit rock-bottom. We allowed 53 points in the first half and the game was broken in the final two, three minutes. We came out of the locker room and tried to change things, be more aggressive and try to play better on offense, but we were not able to do it. It was hard for us to score baskets. They were more aggressive and shot better than us. This is a complicated, frustrating situation; we cannot allow this to happen, to be booed at home. We may have a lot of pressure due to our situation in the EuroLeague, so we have to try to win the next game to start changing things." "They scored 53 points in the first half, so imagine how mentally prepared we were for this game. We didn't play any defense and in the third quarter, even if we wanted, we couldn't. If the game starts like this, you give them confidence, they make everything; a team that had lost by 50 points combined in the last two games. We have to see what is wrong, this is what we should do. We have 10 more games and have to try hard because our pride is hurt right now. I don't know what went wrong, probably everything - defense, offense, technically, physically, mentally... everything is wrong right now. We have to stay together. This is the only way to succeed. We have to stay together and work hard." "We needed to get back to our structure and rhythm. We did great today, especially in the first half, with great intensity on defense and getting easy baskets out of it. We finally made some three-point shots, because it is really important for us to spread the floor. We did a perfect job in the third quarter to finish the game. If you want to look for something you want to complain about, it is maybe the last quarter, in which we kind of lost it a little bit... but overall, we had a pretty good game today." "This was a big game for us. We have been working hard in practice in the last couple of days, getting back to our identity, which is getting after them on the defensive end. I think that, from the start of the game, we did that; we pressured them and made them feel uncomfortable. We forced them to create turnovers and make plays that they were not very comfortable with. This is how we have to play each and every game. I am really proud of the team. Coaches told me to be aggressive, to attack and to be ready to shoot the ball from the weak side. I made some shots and like I said, it was a good win for us."